By the way, don't forget to set PATH and Classpath in Java before running Java program. If classpath is specified in the manifest file then that will be used by JVM and it will ignore CLASSPATH environment variable, If you are not familiar with these details then see How classpath works in Java, must read for any beginner in Java. If you see the error "no main manifest attribute, in Test.jar" it means your JAR file is not a runnable JAR file i.e. it's manifest file doesn't contain Main-Class attribute. If you face any issue related to Java, classpath and path while running your Java program from JAR file, please post here. 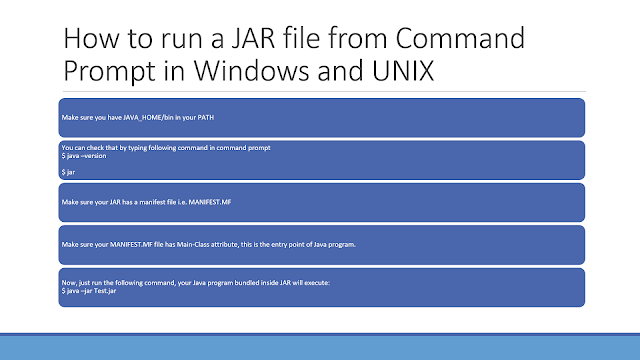 If you don't know how to create executable JAR file then see this tutorial. That tutorial gives you step by step guide to making an executable JAR using Eclipse IDE.